Victims of the purported chemical weapons attack in Douma, Syria. Syrian strongman Bashar al-Assad has done it again. Almost exactly a year after his last illegal chemical weapons attack against his own people during the Syrian Civil War, he has conducted a major chemical weapons assault on a rebel-dominated Damascus suburb known as Douma. Men, women, and children have been indiscriminately killed in the most gruesome way imaginable. This has all occurred a week after American President Donald J. Trump expressed his (understandable) desire to begin drawing down the 2,200 American troops that are presently in Syria (after having effectively defeated ISIS and put significant hurt on other jihadist networks). Now, it seems that some kind of escalation on the part of the United States is in store. Make no mistake: in light of past actions, the United States has no choice but to uphold its own red lines in Syria vis-a-vis the use of chemical weapons. What’s more, as I’ve argued repeatedly in the last few days, the United States must encourage its Israeli and Sunni Arab partners to continue standing strong against Iran. Since Iran is using Syria as a key expansion zone for taking the Levant–and directly threatening Israel–the United States must at least show solidarity with its allies in the region, by attacking Assad for his chemical weapons use. And, as I’ve argued, that does not mean that the United States has to keep its current troop levels in Syria or that the Trump Administration should expand the parameters of its mission in Syria. Fact is, the Assad Regime is too heavily protected by Russia, Iran, and NATO ally Turkey–and the United States lacks the strategic leverage needed to dislodge these powerful backers. Given the president’s recent statements on the matter, it would appear that he is preparing to engage in another strike against Assad for his misdeeds. Replicating the cruise missile strike of last year, while I believe it would be sufficient (given America’s limitations), it is more than likely that the president will conduct a different sort of punitive raid on the Assad Regime. In 2013, on the eve of what would have been the Obama Administration’s big move against Bashar al-Assad for having committed a similar heinous act, the United States was prepared to move militarily against Assad’s forces with a massive airstrike conducted along with the French and British air forces. Yet, that coalition fell apart, when the then-Prime Minister of Britain, David Cameron, opted to defer action until a hostile Parliament could vote on the matter (they did not approve the use of force), which sent ripples throughout the world (notably in the White House, which ultimately also backed away at the eleventh hour from retaliating against Assad, and the French buckled too). Today, under the far tougher leadership of President Trump, it would appear that the opportunity to replicate that strike (only to actually do it) with the French and the British is at-hand. Earlier, Israel also conducted a massive airstrike into Syria. They attacked a notorious Iranian military drone base from whence a hostile drone had drifted into Israeli airspace in March of 2018. The bombing of the base killed at least three Iranian soldiers–including the senior most Iranian military drone force commander in Syria. Now, in the next 24-48 hours, it is likely that the Trump Administration will follow these successful Israeli attacks into Syria with an airstrike of its own–and likely with the assistance of the British and French. This is a good thing. However, there are some considerations to make when preparing to attack Assad’s forces. Israeli Defense Force jets bomb Syrian targets. Notably, the targets will undoubtedly be military in nature. They will specifically likely be those military bases and assets that will contribute to Assad’s ability to continue conducting chemical weapons attacks. So, expect bases housing helicopters, bombers, and other weapons and vehicles to be the first targets. Yet, everyone knows that Assad’s air force is responsible for giving him the advantage he needed to survive–and now win–the Syrian Civil War. Without it, he’d be as dead as Libya’s Muammar Gaddafi. Should the United States and its allies act decisively to punish Assad, they would likely destroy the bulk of these forces. Therefore, the coalition would be removing Assad’s greatest advantage and place his much smaller forces at the mercies of the much-larger (though under-equipped and underfunded) radical, Sunni jihadist enemies. The trick, then, will be to destroy enough of Assad’s air force as to send a clear message: don’t do that again or we’ll destroy your entire air force, and you’ll be left at the mercy of blood-crazed jihadists (and fickle Russian, Iranian, and Turkish allies). If we destroy too much of Assad’s air force, it would remove his ability to launch chemical weapons attacks, but it would also negate his ability to defend himself–particularly from the dangerous jihadist elements in the Syrian Civil War. Should he be unable to defend himself from those groups, the Assad Regime would fall, and Syria–and all of its chemical weapons–would fall into the hands of ISIS and other jihadist networks. 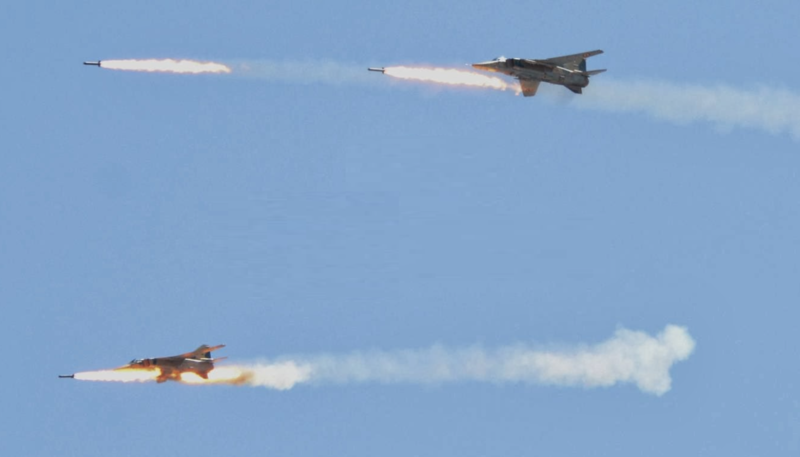 Aging Soviet-built Syrian Arab Air Force jets launch devastating attacks on civilians during the Siege of Aleppo in 2013. According to Tom Cooper at War is Boring, the Syrian Air force was–and remains–in disrepair when the Syrian Civil War broke out in 2011. In 2010, it was estimated that the Syrian Arab Air Force (SyAAF) had roughly 500 aircraft under its command–mostly attack helicopters and various Soviet-era fighter craft, all of which were “locked in their bases” because they were old and unreliable. However, when the uprising began, and as it became clear it would not abate, the SyAAF was pressed into service. After three years of intense fighting and 2,000 SORTIEs, the SyAAF’s role as Assad’s “fire brigade” had taken its toll. By 2014, “the service was left with barely 60 operational helicopters and fewer than 150 operational fighter-bombers, nearly all of which were once again in need of overhaul.” The 2013-14 period of the civil war was the most dangerous for the Assad Regime, wherein the heaviest losses occurred, and the greatest gains were made by the various resistance groups. The only thing that saved Assad during that time was his antiquated air force–and the fact that the West had upheld a strict embargo on the Man-Portable Air-Defense Systems (MANPADS) that could have been used to take down more of the SyAAF in combat. The reason these systems were denied to the resistance was because the West could not ensure that these weapons–which could easily be used to down commercial airliners–would not end up in the hands of jihadist groups, like ISIS and al Qaeda. After the 2013 Siege of Aleppo ended in Assad’s favor, the strain on Assad’s air force diminished. Despite lacking the requisite replacement parts (again, thanks to Western embargoes), Assad’s forces proved to be industrious and managed to keep their ailing air force together on a spit-and-polish at the Nayrab Air Base in Aleppo. When the Iranians and Russians fully intervened after 2013 (Iran had been involved in the Syrian Civil War almost from the start), repairs and reinforcements for the beleaguered SyAAF came online, helping greatly. Although, the Syrian airmen continue exhibiting signs of exhaustion and reckless behavior when in combat. “Currently, what is left of the SyAAF is concentrated at five major air bases, each of which is a home for units usually operating fewer than a dozen of airframes. The American-led coalition should (and most likely will) target these five major air bases and reserve the right to strike against the smaller ones. Neutering the Assad Regime’s air war capabilities will inherently mollify their capability to launch chemical or biological WMD attacks. Further, unlike the 2017 cruise missile strike, any American air campaign against those bases should aim to destroy the runways themselves. While the Syrians could certainly rebuild those runways, it would take time–and time is the one thing that Assad cannot afford to lose. Some major Syrian Arab Air Force air bases (not an exhaustive list). Thus, any airpower that would be required to defend the Assad Regime against the jihadist-led Sunni resistance in Syria, would have to be shouldered by either Iran or Russia. Iran cannot shoulder that burden–and Israel would disallow the Iranians from seriously increasing their airpower in neighboring Syria (just look at what they’ve been doing against Iranian drone bases in Syria). And, the Russians, despite their propaganda, are desperately looking for the exits in the conflict. Fact is, the Russians simply cannot afford to maintain its war footing in distant Syria. Instead, the Russians need a modicum of peace and stability there so that the Kremlin can force the region to play more in the non-kinetic diplomatic realm–where Putin (rightly, so far) thinks he has the advantage over the West. Plus, as the Trump Administration necessarily seeks to draw down its ground forces in Syria, the idea of Russia extending its commitment in Syria (which is quite limited at present) would only drain Russia further in the long-run. It’d likely make them more pliable to Western diplomatic demand in Syria over time, not less. After all, Putin’s dreams of establishing a Third Rome throughout Eurasia is a mirage; it will be his regime’s undoing as much as it was the undoing of the American unipolar order (as well as the French and British imperial orders after the First World War). Basically, the United States should make Putin regret ever having desired a greater role in the Mideast by giving him exactly what he wants: broken Syria (tag: you’re it, Vlad!). Destroying the bulk of Assad’s air forces at those aforementioned five military bases in Syria would accomplish this task nicely–and, with the French and British (and our Sunni Arab and Israeli partners), the U.S. coalition has the juice to accomplish this goal. There’s one other thing that has been bothering me about the response to the recent Douma chemical weapons attack from many (mostly on the Right) in the West: they keep insinuating that it was a false flag attack. These folks assume that the various jihadist groups fighting in the country have access to chemical WMD, and that they desire to keep the United States embroiled in the Syrian Civil War, so as to continue giving them a fighting chance at toppling Assad (and thereby installing a crazed Islamocracy). To be sure, there are (mostly unconfirmed) instances of rudimentary chemical weapons–such as chlorine bombs–being launched by ISIS fighters at U.S.-backed Kurdish forces engaged in Syria. This is a rudimentary chlorine WMD that U.S.-backed Kurdish forces in fighting ISIS in Syria last year reported being attacked with. In fact, things like chlorine WMDs are not very hard to produce. And, given the fact that Western-educated folks, such as engineers and chemists, actually did join ISIS throughout its existence (and continue joining other jihadist networks), it is reasonable to believe that some of the more well-organized jihadist groups fighting in Syria can–and did–build such terrible weapons. However, the extent of the damage reported by Kurdish fighters who encountered these rudimentary chemical WMDs indicates that the unsophisticated nature of these jihadist-produced chemical WMDs was minuscule. Compare that to the confirmed reports of the various chemical WMD attacks in Syria over the past few years that were attributed to the Assad Regime. Even if the jihadists had a steady access to such weapons, those weapons would not have the capabilities that the purported Assad Regime-fired weapons did. Many on the Right want so badly to disengage from the Mideast that they’re willing to look the other way about the fact that Assad did actually engage in another wanton chemical WMD attack. I’m sorry, but he did that. What was his purpose, you ask? Well, Assad isn’t that smart (though he is cagey). He likely heard President Trump’s remarks in which he said he wanted to draw down U.S. forces in Syria, and took that as a sign that Trump was readying to pull out–meaning that Assad could move decisively to finish off his rivals. It is also likely that neither the Russians nor the Iranians approved of the decision, but could do little to get Assad to back down from it (remember, during the Cold War, Fidel Castro was viewed by the Soviet leaders as unstable and out-of-control, yet they stood by him because he was “their man” in Havana. Something similar with Assad may be at play today). There’s another possibility, and this cuts to Assad being cagey: his relationship with Russia and Iran (and certainly Turkey) has always been one of convenience. He knows full well that, if a better Alawite candidate arose in the eyes of Russia, Iran, and Turkey, they’d likely insist that Assad step down and allow that more desirable candidate to take his place in Damascus. It is possible that Assad, not wanting to abdicate, reasoned that, while he doesn’t want greater American forces arriving in-theater, he doesn’t mind having some American forces operating in Syria. The presence of the small American force in Syria has already proven useful to Assad: because of American military movements (and their support of the Kurds), an unlikely alliance of Russia, Iran, and Turkey has congealed around the ailing Assad Regime. As tensions between Russia and the United States mount, Assad’s position as ruler of Syria is solidified, because the Russians, Iranians, and Turks cannot allow for the United States to push too hard against the Assad Regime and the United States does not want to commit to another regime change operation in the Middle East–especially with such a high number of jihadist terror groups involved in the anti-Assad “resistance.” By attacking Douma, Assad ensures that the Americans remain-in-place (and that the Russians and Iranians continue supporting him). Remember: during the Iraq War of 2003, Bashar al-Assad allowed his country to be used as both a conduit and safe haven for al Qaeda in Iraq. Assad was fearful that if the Americans could end the Iraq War quickly and successfully–without the threat of a serious insurgency preventing it from leaving–then the former George W. Bush Administration would opt to strike next at Syria (which was being seriously discussed as early as 2004). Assad reasoned that supporting al Qaeda in Iraq would seriously undermine the American position there, and force the United States to spend an inordinate time on fighting there–or to leave prematurely, thereby mollifying the Bush Administration’s desire to invade or even attack Syria. When it became clear that George W. Bush’s foreign policy would end with him (as Barack Obama was on the ascendance), Assad then switched sides, and backed the American surge efforts. He did this because he knew that not only had the urge for regime change been mollified in America, but the surge was going to end the major American presence in neighboring Iraq, thereby reducing the threat to Assad’s power greatly. Alas, Assad’s chickens came home to roost when the Obama Administration completely abandoned Iraq and the jihadists turned their ire on the weakened Assad Regime. While this article (and others) may have made a large, coalition airstrike sound easy. It won’t be. First, getting the French and British to join up with the United States in a massive airstrike campaign will be tough–both countries have different metrics for engagement and both have different outcomes in mind for such an engagement. Second, as we’ve seen already, the action further divides American political opinion, creating instability at a critical juncture at home (going into a contentious midterm election in which Trump needs all of the support he can get, for starters). Third, taking out Assad’s air force will leave his regime open to successful attack. While Iran and Russia would undoubtedly move to protect him, without the presence of the SyAAF, the centrifugal forces opposed to Assad’s rule might prove too difficult to rollback. And, should Assad be toppled, he most assuredly will be replaced by something worse–possibly even a jihadist. Given Syria’s geostrategic position in the Mideast (being so near to Israel in particular), this would be a nightmare scenario. American war planners in the Trump Administration must, therefore, opt to hit Assad’s air force, but to leave him enough capabilities that he has a reasonable chance at stemming the jihadist surge that will inevitably come from the American air campaign. Trump must also use the 2,200 American troops in Syria as a bargaining chip to get Russia and Turkey to pull both Iran and Assad himself back from the hostilities, and help to create a negotiated settlement that not only ended the conflict, but helped to establish a more stable political environment in Syria. Rumsfeld in 1983 was right. Tucker Carlson in 2018 is also correct (although, he reduces our choices in Syria to a stark dichotomy of either war against Assad or retreat. It is neither: we can reduce our presence as I’ve argued and still retaliate against Assad’s forces for their malign actions against civilian targets without trying to remove Assad and remake Syria into South Dakota).